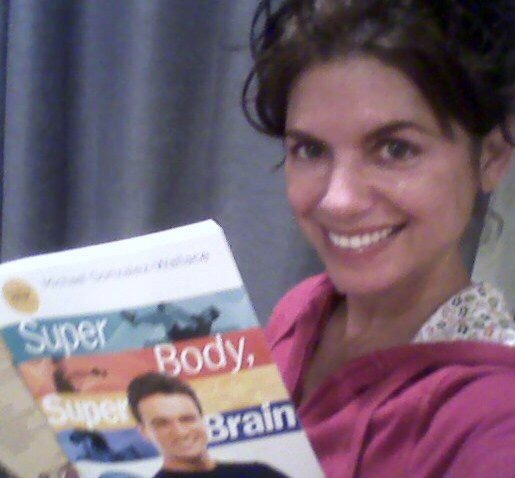 SUPER BODY, SUPER BRAIN by Michael Gonzalez Wallace is my #1 pick for a fitness book. It’s based on the very latest, cutting-edge brain research. Michael’s program is unique in that it provides a whole brain workout that requires thinking and precision through specific left to right, and front to back movements. This is the first time someone has created a program which taps into how complex circuits in our brains connect to our muscles through voluntary and intentional movement. Huge implication for aging. For more than a century, medical science firmly believed that our brain could not repair itself and that we were born with all the brain cells we would ever have. Over the last 20 years, research has shown neurogenesis, the creation of new brain cells, actually does occur in the brain with the right training. Michael brilliantly harnesses this knowledge to provide expert training on how your brain connects to your body through motor and sensory pathways. In SUPER BODY, SUPER BRAIN he provides compelling evidence that exercise is not only good for your heart, but good for your brain. He aptly demonstrates an exciting daily fitness program that stimulates your brain cells during your workout. He shows you how to work out smarter, instead of longer. As someone who has specialized in medical/health for over two decades, I strongly endorse Michael’s program. When you first learn of it, you’ll think it must be a gimmick. It’s not. As mentioned, it’s based on decades of scientific research. I use the program myself and have known Michael for years. He’s the real deal; extremely passionate about the program because he knows it works and can help others improve their energy level and entire well-being from the inside out. In today’s ever competitive world, it’s not enough to have a Super Body. You absolutely need a Super Brain. Michael shows you how to build both at the same time. The benefits of his unique program are long overdue within the entire health community. Super Body Super Brain by Michael Gonzalez Wallace is definitely the future of fitness. Everyone at any fitness level from beginner to pro will take something away from this book that improves their health.